produce a structure characterized by contemporary architectural design. The smooth, sleek beauty of the low pitched roof also reduces the volume of interior space to be heated and cooled. The most common clear spans from 30' up to 120'. With wider spans available to meet the customer's needs. furnish the Owner with maximum building volume and are especially desirable for storage buildings requiring high interior clearances. Varied architectural effects can also be obtained with the steep roof pitch and standing seam roof panels commonly used today. are extremely popular in buildings where straight sidewall columns are desired. This design is most practical in buildings up to 40' in width. are best suited for wider buildings where a straight sidewall column is desired. For spans larger than 60' economy can usually be realized through the use of an interior column. This frame is generally best suited to low profile frames, but can be built to any desired roof pitch. The most common widths from 60' to 200'. With wider widths available to meet the customer's needs. For extremely wide buildings, this design is most economical where interior columns are not objectionable. 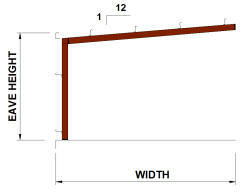 This frame is generally best suited to low profile frames, but can be built to any desired roof pitch. 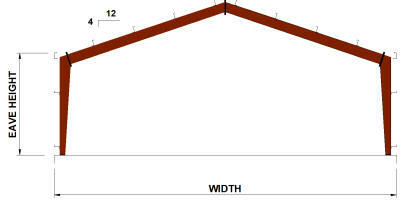 The most common widths from 120' and up. Most of the above frame types are also available as single slope frames. Single slope frames can be used to expand and existing structure or as a new stand alone building. are most commonly used for building additions or to provide office and storage space to a larger building. BIGBEE typical uses built-up or hot rolled endwall design of our buildings. However, a interior frame should be installed at either end of a building when future expansion is anticipated.